The railway station „Viareggio“ is about one kilometre from the sea. In the area between the station and the coast is the center of the city. If you go from the station to the sea and on the shore a few hundred meters to the left, that is, to the south, you reach the port. Behind the beach there is a longer pedestrian promenade with many restaurants, shops and cafes. Viareggio is the largest seaside tourist resort in Tuscany and, after Livorno, the second largest seaside town in Tuscany. 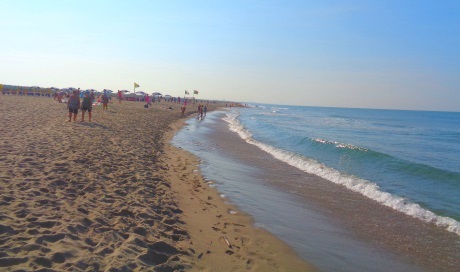 Viareggio has several beaches, the beach to the north is extremely long. Actually the whole region north of Viareggio via Forte di Marmi to Massa is a managed beach (total length far more than 20 km). There are rows Bagno and Bagno. A Bagno (Plural Bagni) are bathing establishments. They rent out umbrellas and sunbeds, but also have other typical beach facilities such as restaurants, cafes, small shops, toilets, showers, changing rooms, rentals of water sports equipment and much more. To the south is also a longer beach. This beach, called Lecciona, which starts not far from the large port of Viareggio, is much less managed. Here you can find sections where you can lie on your own towel and do not have to rent an expensive deck chair with umbrella. However, the first kilometre from the port to the south is also occupied by Bagni. Immediately after these bathing establishments, you finally have free access to the beach. The sandy beach is, as everywhere around Viareggio, clean, wide and beautiful. After about 2 km walk from the centre towards the south we finally reached the free beach of Viareggio. The prices in the Bagni of Viareggio are also considered high for Italy. In summer (July and August) an umbrella with 2 sunbeds can cost 30 euros per day and more. No other place in Tuscany has so many beach tourists. In Italy Viareggio and neighbouring communities are probably surpassed only by the regions Cavallino / Jesolo and Rimini (both at the Adria, thus east coast). The region Viareggio belongs in any case to the TOP 5 bathing regions in Italy. The old centre of Viareggio is about halfway between the train station and the beach. Today, several streets in this area are pedestrian. The main shopping street is the „Via Cessare Battisti“. 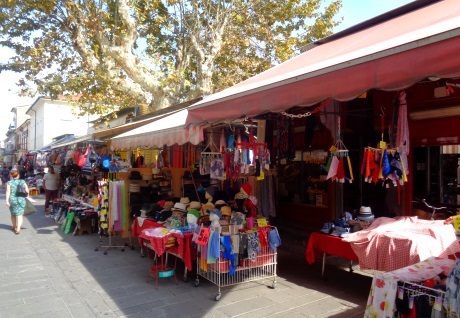 In the central square „Piazza Cavour“ there are many simple stalls selling all sorts of souvenirs and household items. Next to it is another square with a permanent food market. 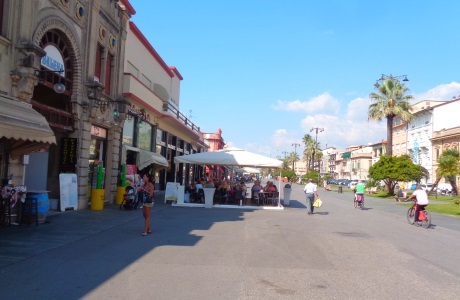 Many shops can also be found on the beach promenade of Viareggio. The long pedestrian promenade by the sea has developed into a kind of second city centre, at least as far as shopping and gastronomy are concerned. Viareggio is known in Italy for carnival. Like many countries, Italy has carnival strongholds. Viareggio is the second most important carnival city in Italy after Venice. The carnival in Italy is at the same time as in England or Germany. By train: Viareggio has good rail connections. There are direct trains to Florence 1-2 times an hour (about 1 1/2 hours). Some of these trains go via Pisa, others via Lucca. There is also a train along the coast. To the north it goes via La Spezia to Genoa, to the south via Livorno and Grosseto to Rome. 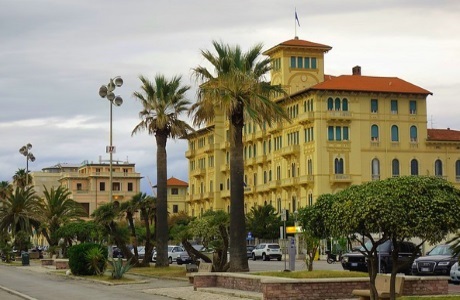 Of course we couldn’t try all the hotels in Viareggio and the surrounding area. However, we have compiled a small, incomplete list of good and rather inexpensive hotels. The hotel prices in Viareggio are strongly dependent on the season (as in the whole Tuscany). August is the most expensive, as almost everywhere in Italy. 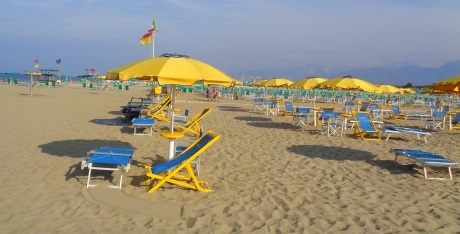 Then the Italians have holidays and Viareggio is a holiday resort especially for Italians.